Was Joe Neguse privately chosen by Democratic Party insiders as heir apparent to Rep. Jared Polis’s seat representing Colorado’s 2nd Congressional District in Congress? 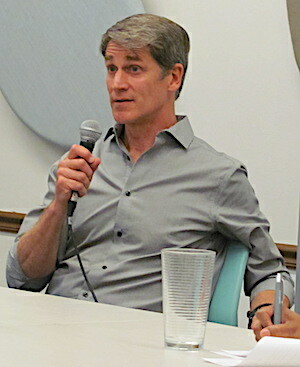 Both candidates spoke to the issue at a Monday, June 4, candidate forum hosted by the group Together4Boulder at the downtown Boulder Public Library. 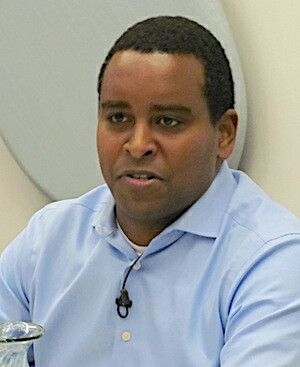 Neguse said that, yes, he has numerous prominent supporters, but “they’re supporting me because they know me, because they’ve worked with me, because they know my record.” He quickly ticked off current liberal Boulder City Council members Sam Weaver and Mary Young and former Colorado state legislator Ruth Wright as among his supporters. Neguse noted that only 3 percent of his campaign donations have come from corporate PACs — including the law firm Holland & Hart where he was employed for six years — although he’s also received funding from “various lawyers” at Denver law firms. He went on to decry the influence of money in politics and to call for public financing of elections. After Neguse finished his hour-long Q&A session before the audience of about 60, it was his opponent Mark Williams’s turn for the second hour. And, only when asked, Williams addressed the “anointed heir” charges. When Polis announced in June of 2016 that he wouldn’t seek reelection to his House seat, Neguse announced his candidacy “almost literally the following day,” Williams noted. Around that point, some people began suggesting that he run against Neguse. He started pondering. One thing that troubled him was why, “in the Year of Women,” there were no women seeking the CD-2 seat. “I don’t know if this is the truth, but it probably wasn’t done in a cigar-smoke-filled room, but I would bet dollars to donuts that it was in a conference room in a law office in Denver and it was probably a bunch of old white guys. … And women were cut out of the deal at that point,” Williams said. Williams took a leave of absence from running the BoCo Dems to explore entering the race. Subsequent callers, he said, praised his work with the local Dems and assured him that “we take care of our own.” They told him that, when posts become available in 2020 due to term limits on incumbents, “we’ll make sure we have something for you. These kinds of insider fixes amount to “low-level corruption,” he charged: “This is why people don’t trust politics.” The near-automatic Democratic win in liberal CD-2, a result of gerrymandering, has led to “a certain level of intellectual laziness,” he opined. Seeking endorsements, he was rejected by a progressive veterans’ organization (although he’d been an Air Force F-15 fighter pilot) and by the AFL-CIO (even though, as an American Airlines pilot, he’d been one of a handful of pilots who honored a flight-attendants’ picket line). Another Neguse backer who is not Williams’s favorite is Ken Salazar, former U.S. Senator from Colorado and Interior Secretary, who Williams said had recently served as attorney for Anadarko after an Anadarko pipeline blew up under a house in Firestone, Colo., on April 17 of last year, killing two. Williams was concise: “It’s time to ban fracking.” He said the oil and gas industry, which he regards as “in its final battle,” needs to be met with a “united front” among the Boulder County cities. At the national level, left-leaning Dems have cried foul at how the Democratic Congressional Campaign Committee has lent heavy-handed support and funding to centrist Dems against more leftist, Bernie-ite opponents. One such instance was documented via secret recordings in Colorado’s nearby 6th Congressional District, which wraps in a crazy-quilt shape around Denver. Neguse endorsers, per his campaign website, include quite the Who’s Who: former District Attorney Stan Garnett, Boulder Mayor Suzanne Jones, former State Senator Rollie Heath, former Boulder Mayor Will Toor, current Boulder City Council members (along with Weaver and Young) Aaron Brockett, Jill Grano and Bob Yates, former State Rep. Claire Levy and Boulder County Sheriff Joe Pelle. The relatively short list of endorsers listed on Williams’s campaign website includes former State Senator Ron Tupa, former Boulder City Council members Steve Pomerance and Allyn Feinberg, and two current Council members, Lisa Morzel and Cindy Carlisle. Host organization Together4Boulder was formed in 2017, uniting 30 Boulder neighborhood groups calling for “responsible growth” in Boulder. Its members endorsed and worked for five candidates in the 2017 City Council election, four of whom were elected. CORRECTION: Text was corrected to show Williams flew for American Airlines, not United. I am very impressed with Mark’s progressive message and sincerity. I intend to support him fully. Bernie Sanders is not a Democrat, yet he insists he ought to be the guiding light of the party. In my opinion, he helped elect Trump, something I don’t appreciate. Thanks for this insight into Neguse’s backers. It’s definitely concerning. I could not find anything about Mark William’s stance on LGBTQ causes? Why is that not on his campaign webpage? As far back as 1974 I declared my candidacy for a local office. Unbelievably, even though I went into the county assembly as the only declared candidate, many of these same “annointers” were in action even then and waived the rules from the floor to force me into a primary. I was not their chosen candidate. At that time in history, they actually wanted a man. This year I went to the county assembly but this time just to endorse another candidate. I sat there and I watched some of the same people that I have seen in action over these many decades doing their thing running around lobbying the delegates to vote for their ‘chosen’ candidate. As a result, there ended up being very few alternate selections on the primary ballot. A choice by the voters was taken away. Don’t make the mistake of thinking that this is a Hillary/Bernie split It is much more than that. Appropriate candidate selection is driven by people who think that they should be continuing as the “powers that be”. What this does is prevent new people from trying to run for public office. Not just new people though…one has to have the right clothes, enough money to attend more expensive fundraisers, the right social position, the right people supporting you at this intimate party level. Any number of tests must be passed. In my mind, there are no more discriminatory words than “it isn’t it your turn”. The Democratic Party is busy rigging primaries all over the country, including here in the 2nd District. As a consequence, there is unlikely to be a “blue wave” as disgusted voters stay home on election day. And if the Dem establishment is successful at suppressing progressives, even a ‘wave’ will leave us where we were before 2016 with a bunch of neoliberal warmongers that look a lot like republicans. This inauthentic opposition will turn off even more working class, millennial and progressive voters by the time 2020 rolls around. The comment that Bernie Sanders helped get Trump elected is a pile of dung with no factual basis. The Democratic Party establishment lost the 2016 election entirely of its own accord. Democratic Party must learn that People are tired! People must have a voice, and it must be heard! Mark Williams, a Progressive Democrat, will be a true people’s representative on issues affecting us — our environment, our schools, economy, not mandated issues. We, the people, must recover our Democratic process and vote for true progressives like Mark Williams. IT’S UP TO YOU AND ME, stop further erosion of our Democratic principles! My vote is for Mark Williams! After careful consideration, I’m casting my vote for Mark Williams. Seems eminently qualified, and if campaign run smartly, he can win. One correction that needs to be repeated EVERY time the 2016 presidential election comes up: Hillary Clinton WON the popular vote by over 2,000,000 votes! Don’t make the mistake of thinking the Electoral College outcome was unaffected by Trump-Russian collusion.